Between vineyards and scrublands, we welcome you to our former winemaker house in Pouzols in the Hérault Valley, 30 minutes from Montpellier, easily accessible by the A75 motorway. The place is full of charm with its beautiful garden and a swimming pool, 3 spacious guest rooms and contemporary cottage that can accomodate 4 people. This former vineyard house, surrounded with vineyards and scrublands, has a beautiful garden with lush vegetation. Most winegrowers' houses date from the golden age of wine. They were designed to accommodate the farmers and their families and store their tools. Their size and decoration are typical of this architecture. Most of the time, the first floor windows, intended for habitation, are very high. The reception room, where breakfast is served, opens directly onto the terrace and garden. 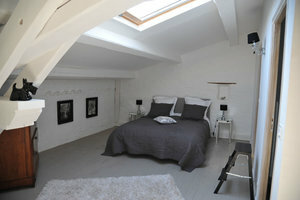 In case of rain, it can accomodate all our guests in this cozy space with stone walls on two vaulted arches. This room is the old barn, where horses use to rest and eat and farmers stored their carts. The reception hall can be rented for seminars, family reunions, business meetings ... It accommodates up to 40 people. The swimming pool is available for guests under certain conditions (respect of other guests and hygiene) as well as the spa (for adults only). During your stay in Hérault, you will find many attractions within a 30 minute drive: Montpellier (35 km), Lodève (28 km), Béziers (50 km), Canal du Midi, a Buddhist temple, the sea (40 km). The A75 motorway is free and the exit is only 5 km from our guesthouse. Some places to visit: Voted one of the most beautiful villages of France in 2012, Saint Guilhem le Désert is 25 minutes from Pouzols. Spiritual stage on the Way of Saint Jacques de Compostelle, it is very popular with hikers for its beautiful landscapes and rare botanical species. Do not miss the Abbey of Gellone and museums. The Devil's Bridge is located in the Gorges of Hérault, 14 km from Pouzols. It is one of the oldest Roman bridges in France. Its construction took place in 873. The Devil's Bridge is registered as a historic monument since April 5, 1935 and part of the UNESCO World Heritage. The lake of Salagou is an artificial lake for swimming and water sports. Hiking and cycling are also practiced around the lake. Easily accessible from the motorway A75. The galleries of the Clamouse Cave open a few hundred meters from the Devil's Bridge, along the Gorges of Hérault. The cave is classified by the Ministry of Ecology and Development "scientific and picturesque site." Saint-Jean-de-Fos gained its reputation through its potters from the fourteenth to the sixteenth century. This tradition of pottery, including green glazed pottery, has survived and is still visible in the village streets. Sète is called the singular island because it is surrounded by water on all sides. It is a fishing harbour between the Bassin of Thau and the Mediterranean Sea and its beautiful beaches. Georges Brassens and Paul Valéry were born in Sète. Pézenas is the city of Molière, 25 minutes from Pouzols. Well known for its antique shops and its Saturday market on Jean Jaurès square since the fifteenth century, Pezenas offers beautiful walks in its old streets.